Brian – I bought the bike in April 2010 from a little old man that reminded me of the movie “The World’s Fastest Indian.” He is a great guy that lives everything related to two wheels. The bike was in extremely bad shape and had a bush growing out of the front tire. I grabbed a pick and had to dig up the bush to get the bike free. I wish i would have had my camera. When I got it home I hosed it down and stripped it to the frame. I ordered a pile of parts from TC Bros to include the hardtail kit, electronics and battery box, handlebars, etc. 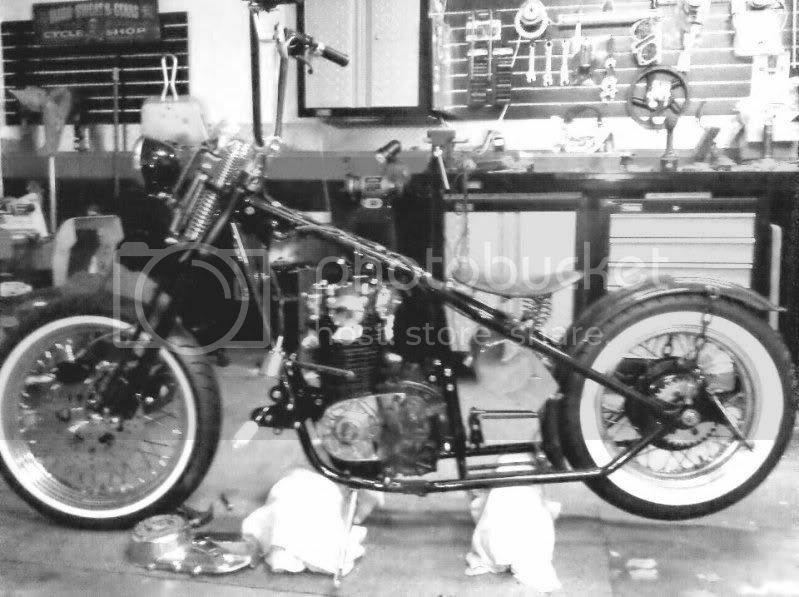 All work on this bike with the exception of finish welding the frame and paint was done in my garage. I spent months saving up money and buying parts here and there, test fitting different fenders, and a little trial and error mounting designs. I had originally planned on leaving the seat bare but after leaving the bike outside in the Phoenix sun for an afternoon I quickly changed my mind. I got quotes from several leather workers, to have the seat done and eventually decided to try it myself. This undertaking was life changing, My first seat was a disaster but I learned a lot from the experience. After the bike was capable of starting and stopping I rode it around for about three months. Rebuilt the carbs at least 10 times before I convinced my boss to buy a Ultrasonic cleaner for his lawnmower shop. the final cleaning with all new gaskets, jets, and bushings did the trick. Speaking of the lawnmower shop, almost every mount and bracket on the bike is made from the old reel lawn mowers. A friend of mine had some contacts with a local powdercoater so after all the bugs either presented themselves or fell off I tore the bike down and sent it in. The motor was in bad shape, I had a smoke screen toward the end of my testing. while the bike was getting powdercoated I rebuilt the motor, new seals, gaskets, rings, and paint. I used VHT hi temp wrinkle on the cases and spent at least 10 hours polishing the side covers and any other piece i could think of. I decided to ditch the stock ECU and picked up a Boyer Brandsen ignition. The tank, fender and electrical box got painted by a friend of mine that works at a local body shop. Its the same color code as the new mustang Redfire Red but with a different candy base. I got sick of the red tank by the time I got it painted so i told him to surprise me. It turned out amazing. To top it off i had it pinstriped by an artist named Slo. Anyone in the Phoenix area should look him up, he also does amazing work at a fair price. I modified the kicker to accept a harley pedal, and installed all new wheel seals, bearings, steering head bearings, riser bushings, and hit up Ace Hardware for almost $200 in stainless nuts and bolts. I had the bike back together in three days after the paint came back. Fired right up, adjusted the timing cam chain and valves and it has been trouble free since then. Before i sent the frame in i drilled it for internal wiring so the harness is hidden for the most part. I used an auxiliary switch panel from an off road place and a battery lockout for the main keyed power. I didn’t like the plastic “key” for the lockout so i made my own from a couple of washers and a piece of round stock. I also found some metal bee’s on ebay and made use of them on the bike in various places like the axle plates, steering head supports as well as one right in front of the seat and one on the key. they are JB welded on and then powdercoated over. it turned out slick and looks great. I finished the bike in February of 2011. I entered it in a bike show a few months later and it took first place in the metric class. Since then i have been itching to start another one. I love riding this bike but to me the real enjoyment came from building it. Not Bratstyle- “Bertstyle” FOR SALE! man, I love this website ! Nicely done. Normally not a big fan of the sporty tank, see them on just about everything these days but this one works nicely with all the rest of the bits and pieces. Pretty slick. Really nice build and I especially like the leather. Nice build Man, I always like a good tale about how one man/lady can spend his/her time tinkering away in the garage to release a little bit of his/her own personality in the form of a sled like yours. Be true brother. Forgot to say, I love the RHS mounted saddle bag, I gots to get me one of them. one of the most awesome bikes ive had the chance to see the changes from its grave of weeds growing about it. looks even better in person than in the pics. ted – thank you so much for posting my bike. after having it up for sale for almost a year i sold the bike today. cut and paste to see the entire build from start to finish. its a strange feeling to sell something that means a lot to you. it was an emotional experience. stay tuned for build #2.
wish i couldve ridden that day you were over. but if this one impressed me like it has. i can imagine the next one will be even cooler. Is that back wheel stock? that thing is sweet!! really nice job! the back wheel is stock. its amazing what a photographer can do with camera angles. the pictures have a “larger than life” appearance to several components. the guy that took the pictures is named Sam Lazoya. he is the photographer for Sucker Punch Sallys. Maybe Ted can post up some more pictures of the build so you guys dont have to sign up for an account at the underground. I assumed that most of you already had one. Absolutely flawless! Congrats on a top notch build. I hope mine ends up 1/2 as clean as yours. Thanks for the inspiration to press on. No problem and thanks for sending in the pictures. Glad you’re able to sell the bike. Are you planning to build another one? I am surprised that it took that long to sell, I am glad you decided to show it here. i am already in the process of build number 2. i might change up a few things from this one. a quick message to the guy that bought the bike. i lost your phone number and address. if you still want the brake rotor sent to you please give me a call and i’ll get it to you.